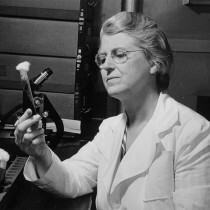 Sixty-five years ago, scientist and educator Pearl Kendrick became a lecturer in the Department of Epidemiology at U-M. It was a capstone in an incredible career that would change the landscape of infectious disease and save countless lives. In 1920, the Michigan Department of Health was facing an uphill battle: infectious disease caused almost 35 percent of all deaths in Michigan, but there was no cure in sight. The state legislature increased Department of Health funding for developing vaccines for what were considered common diseases, among them whooping cough, also known as pertussis. At the time, it killed about 6,000 people in the United States per year, most of them children under five. Scientists had attempted to develop pertussis vaccines in the past, but none had conducted a study rigorous enough to convince doctors it worked. Dr. Kendrick proposed a controlled field study, enlisting doctors, nurses, schools, and families throughout Grand Rapids to help test her lab’s version of the vaccine. 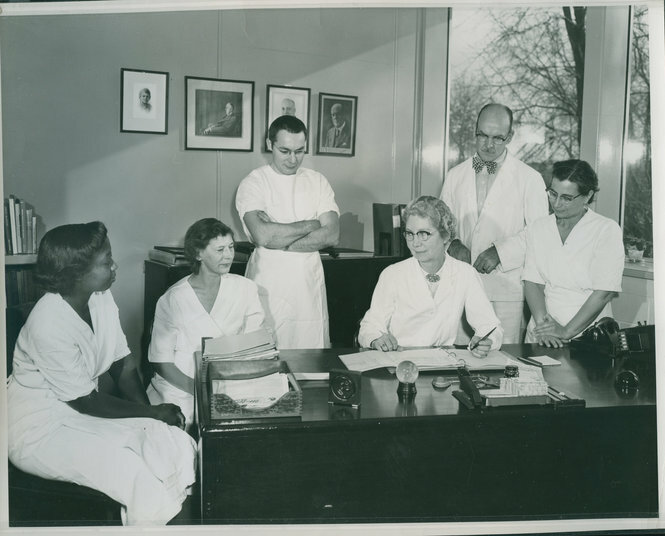 Because vaccine field studies were relatively new, Kendrick and her partner, Dr. Grace Eldering, had to create all the forms and procedures from scratch. Because their lab still needed to carry out routine public health tests on top of the pertussis research, the two women often worked overtime, returning to the lab at night to analyze more samples. The first trial, which ran from 1934 to 1939, followed more than 4,000 children, allowing them to compare results across a wide range of variables. Those results were promising. The study found that vaccinated children were significantly less likely to catch whooping cough, and even when they did, the cases were milder. Kendrick faced a brief setback when a similar study carried out by a Cleveland lab found no significant difference between vaccine and control groups. Assuming both studies were valid, the medical community hoped this meant that Kendrick’s vaccine was more effective. To test this hypothesis, an additional field study using the Grand Rapids vaccine was carried out in New York. This second study successfully replicated Kendrick’s initial results, and her vaccine went into mass production. Throughout the 1940s, Kendrick’s team continued to improve the vaccine they created. A third woman in their lab, the African-American chemist Loney Gordon, isolated an especially virulent strain of pertussis that made an even more effective vaccine than the first. Kendrick and Eldering combined the vaccines for three diseases—diphtheria, pertussis, and tetanus—in order to spare children the pain of getting three shots at once. This work made Kendrick a world-renowned expert in pertussis and vaccine field trials, and she traveled widely as a consultant for the World Health Organization. By 1951, the percent of deaths in Michigan caused by infectious disease had dropped from 35 percent to just three percent, and Dr. Kendrick left the Department of Health to return to education. She joined the faculty of the U-M School of Public Health, where she taught in the Department of Epidemiology, and continued to research whooping cough. The chair of the department at the time was Dr. Thomas Francis, whose own legendary work on the polio vaccine trials of the 1950s owed a debt to Kendrick’s pioneering field study. Kendrick taught at U-M until her retirement in 1960. The Bentley Historical Library houses Pearl Kendrick’s papers, which document the work of the pertussis trials through professional correspondence, lab notebooks, and publications. Her personal correspondence and diaries offer glimpses of her life outside the lab. Her family wrote to her often (including a young nephew interested in the fact that she was “chasing bugs all the time” in her laboratory). She was an avid birdwatcher who recorded descriptions of the birds and flowers she saw while exploring the Nichols Arboretum. And she kept a home with Grace Eldering from the early days of the pertussis trials until her death in 1980. To see a complete list of materials, visit the online finding aid for this collection.